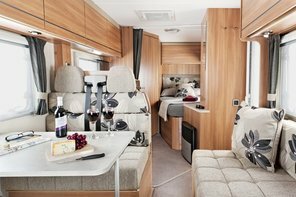 Aggie is an absolute beauty with 5 versatile berths and a rear lounge and dining saloon both of which can be converted to beds in 2 minutes. 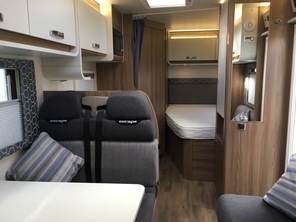 The rear lounge can be converted to a twin or double to suit and is ideal for adults or to pop a couple of youngsters away for an early night. 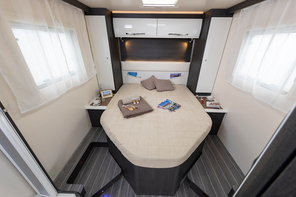 There is a drop down double bed above the saloon area which children or adults 6 and over love and a single in the saloon area. 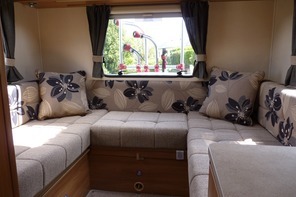 She also benefits from a solar panel, bike rack, good external storage, awning and reversible "captains chairs". 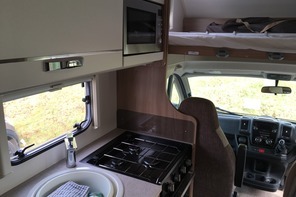 She also has cruise control for long trips to Scotland and cab air conditioning plus TV/DVD. 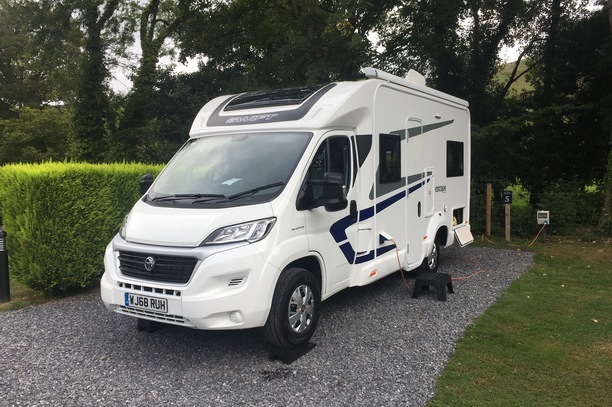 She has excellent outside and inside storage, although it's always best to remember that it's still camping, just without the damp, cold nights and rain. 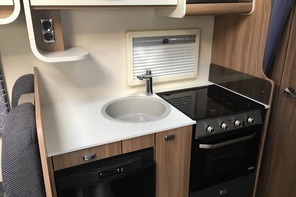 Zefi is a beautiful 4 berth automatic motorhome with all mod cons including microwave and a very stylish Italian design. 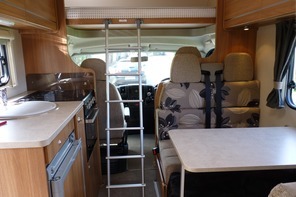 She is only 7.4M so very manoeuvrable and has excellent outside and inside storage lockers. 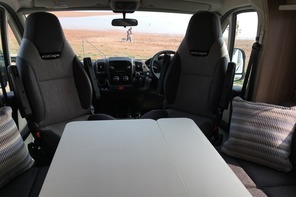 This hire vehicle has 2 double bed options plus a single so is ideal for 2/5 adults or 2 plus 3 children. 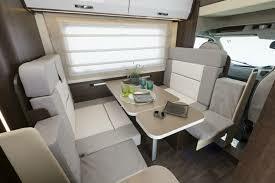 It has a drop down bed which can be left permanently made up and a luxurious seprate bedroom at the rear. 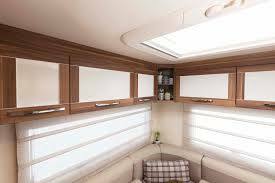 It has lots of light curtesy of the large skylights and has a lovely dining area with extendable table and reversible "Captains chairs". 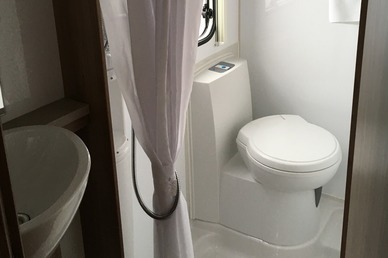 It also has a bathroom and separate shower. 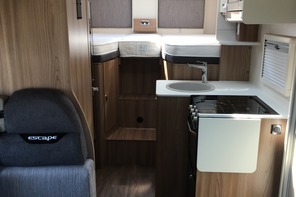 Oscar is a beautiful 5 berth vehicle with great versatility as it has 4 potential bed options and fantastic external storage for body boards, picnic kit etc. 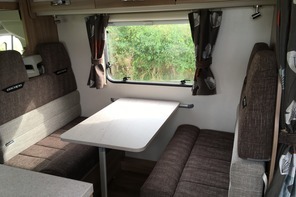 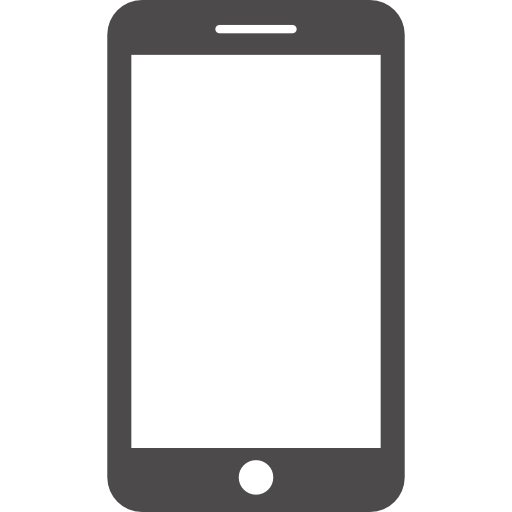 He has a double or twin option at the rear to suit which can be for either 2 children or adults which is fixed and therefore does not need making up each day. 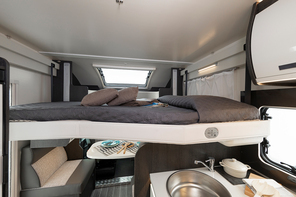 He also has a drop down bed with safety net around and with short ladder which can also be left made up and simply pushed back up when not required and is very popular with youngsters over 5. 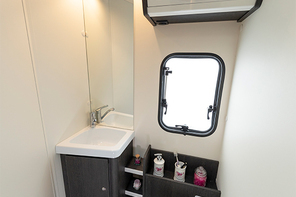 There is also a “make up” bed in the main saloon at ground level for anyone preferring to keep their feet on the ground. 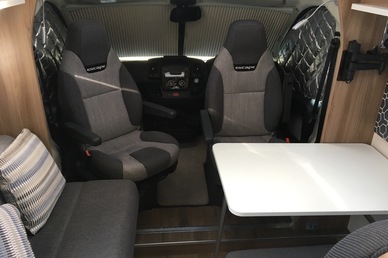 This vehicle also has “Captains chairs” which spin into the cabin to make a very large living space with L shaped lounge round the removable table. 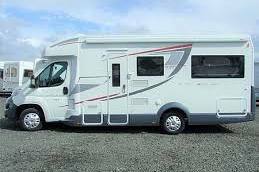 He also has a very large fridge. 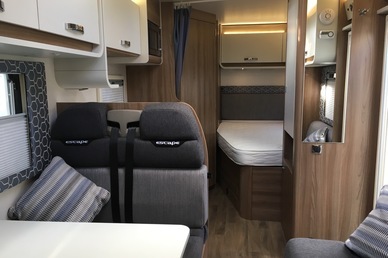 Zego is a 2/4 berth 4 seat belt motorhome hire vehicle which is very popular with couples as she is smaller with fixed bed and more fuel efficient or a couple with one or 2 tiny ones. 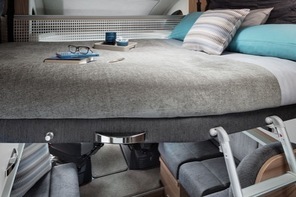 She has a fixed bed at the rear that remains made up for convenience and a small queen size double at the front which is made up in the saloon plus "captains chairs" that reverse into the cabin saloon area. 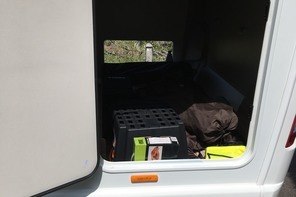 She has a medium size storage locker for picnic kit etc and good lockers inside for sensible packers and an additional microwave for an additional cooking option. 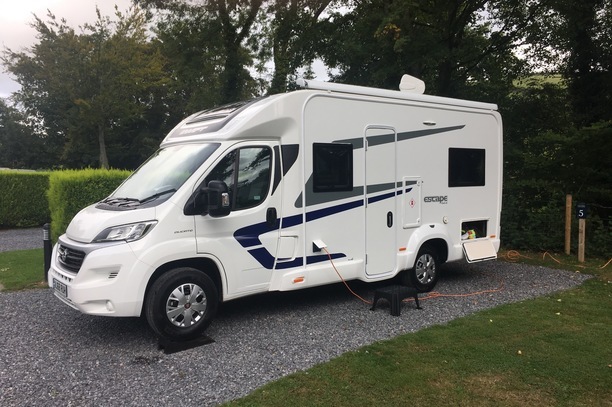 This motorhome hire vehicle has a larger bathroom, the best fuel economy in the fleet along with Kazo and is very easy to drive and operate. 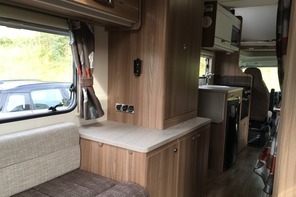 Roo is a 2/4 berth 4 seat belt motorhome hire vehicle which is very popular with couples or a couple with one or 2 tiny ones. 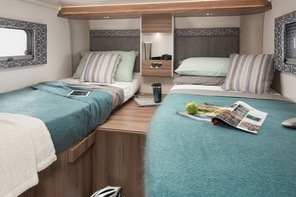 She has a fixed bed at the rear that remains made up for convenience and a small queen size double at the front which is made up in the saloon plus "captains chairs" that reverse into the cabin saloon area. 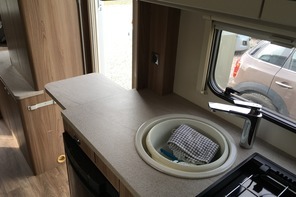 She has a medium size storage locker for picnic kit etc and good lockers inside and microwave as an extra cooking option. 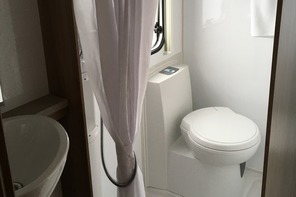 This motorhome hire vehicle has a larger bathroom, the best fuel economy in the fleet along with Zego and is very easy to drive and operate. 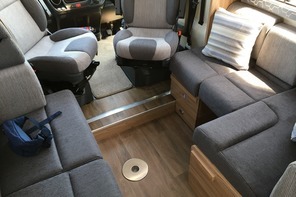 Kizzy is a 5 berth 5 seat belt motorhome hire vehicle with over cab double bed with proper mattress, rear lounge that converts in 1 minute into a double and a centre bed in the saloon that converts easily to a queen size single. 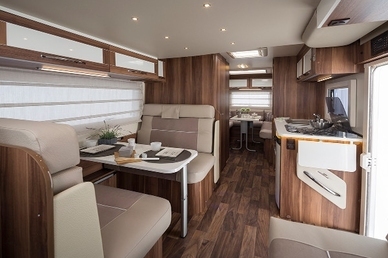 She is great for Mum and Dad to have some space and a glass or mug of something nice in the rear lounge while the youngsters play outside or sit in the saloon. 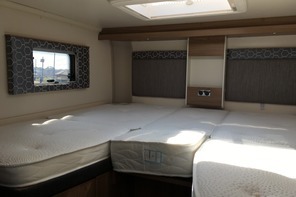 She is a very popular layout with good locker storage inside for sensible packers. 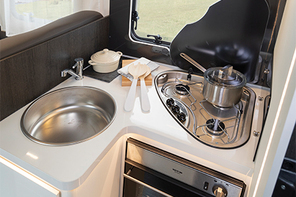 As per all vehicles she has a luxury bathroom cooker, hob, microwave and everything that you need. 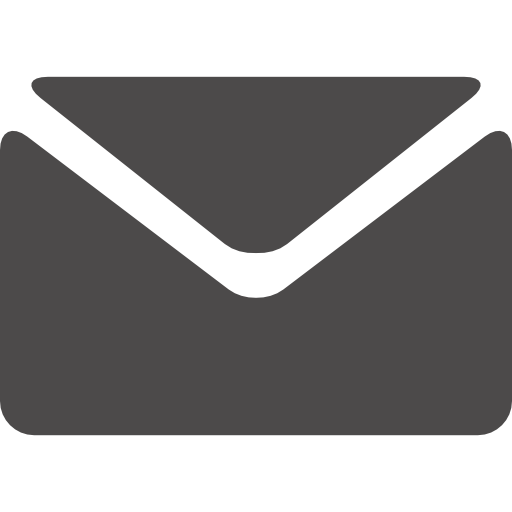 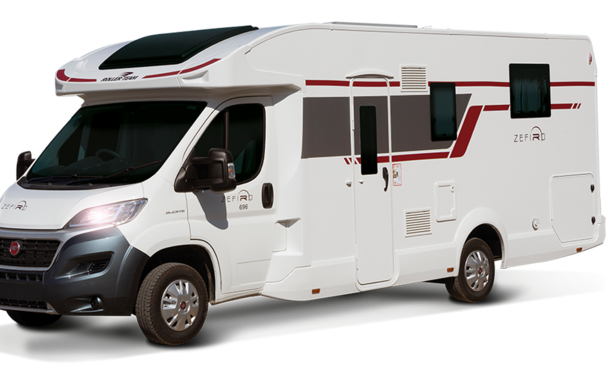 Purchase a new Motorhome from Alan Kerr and receive your full hire fees (up to 2 weeks) back as discount! 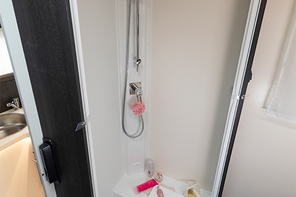 See Try Before You Buy below and note that this cannot be used with any other offer at Alan Kerr. 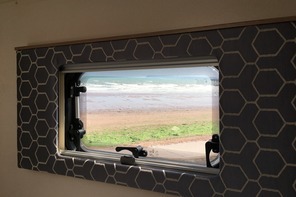 Great for Torbay, Ashburton,Teignmouth, South Hams, Plymouth, North Devon, South Devon, Cornwall, Devon, Dartmoor, Torquay, Paignton, Babbacombe, Newquay, Padstow, Barnstaple, Bideford, Tavistock, Tiverton, Dawlish, Exmouth, Sidmouth, Glastonbury, Camp Bestival, Truro, St Austell, Fowey Falmouth, Exeter, Bodmin, Perranporth, Wadebridge, Watergate Bay, Looe, Dorset, The Lizard, Penzance. 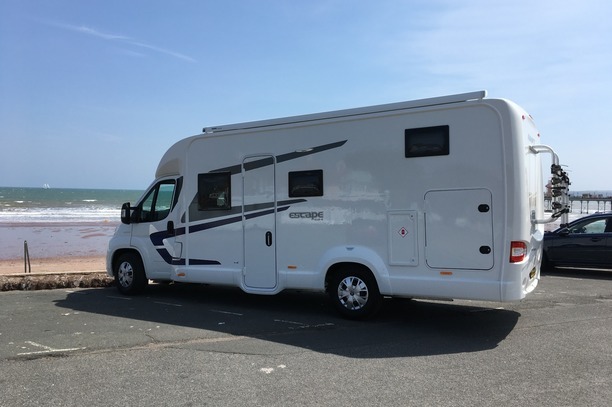 We offer 2, 4 and 5 berth Devon based motorhome hire vehicles/ Campers and all vehicles can be driven on a standard non C1 licence as they are all under 3.5 tonnes. 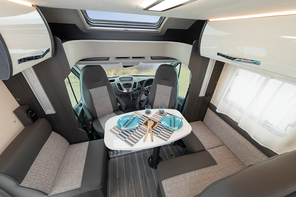 All vehicles come with wind out sun canopy (awning) and bike rack and everything that you could possibly need inside from cutlery to TVDVD to salt and pepper and all including luxury bathrooms. 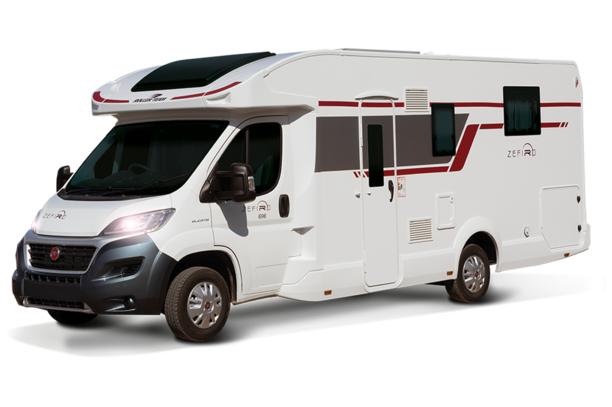 All vehicles have Euro 6 engines and offer over 30 MPG when driven sensibly and are offered full of fuel and propane with toilet chemicals for your convenience. 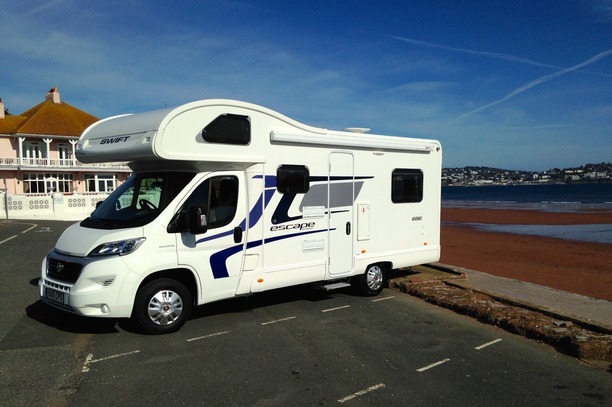 Please see below a selection of vehicles at our depot in Devon all of which can be used for motorhome rental in Devon, Cornwall, Dorset or indeed anywhere in The UK and Europe. 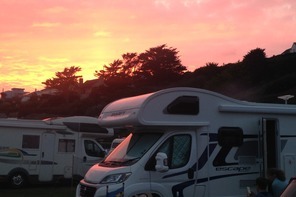 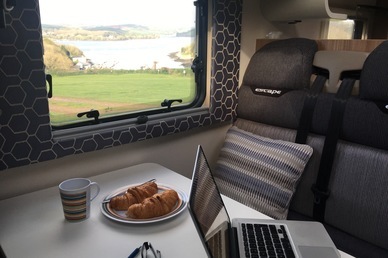 Why Go South West Motorhome Hire? 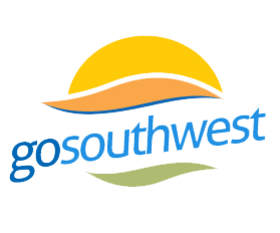 Fed up with, airport queues, air traffic control strikes and hotels not matching up to expectations and without the view you were promised? 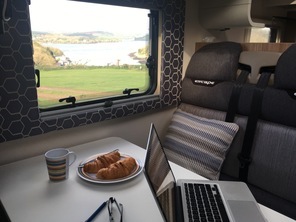 Skip all that in favour of luxury accommodation that travels with you with guaranteed unbeatable views of the countryside and coastline. 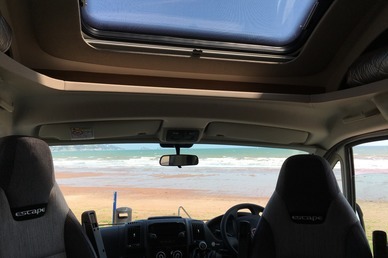 Ever wanted the freedom to choose where you go, for how long and then change the wonderful scenery in favour of another view? 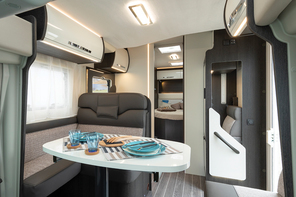 Hiring a state-of-the-art motorhome offers all this and more, plus the chance to share it with your loved ones in the great outdoors!